Calm your body and mind thru this Ayurveda treatment, made of a blend with aromatic medicine plants and seeds, this tonic prevents hair loss, hydration, and curly definition. A gentle and continuous aromatic warm stream spread generously across the front head, combined with a scalp massage, will melt away all worries and tension promoting a peaceful mental state. 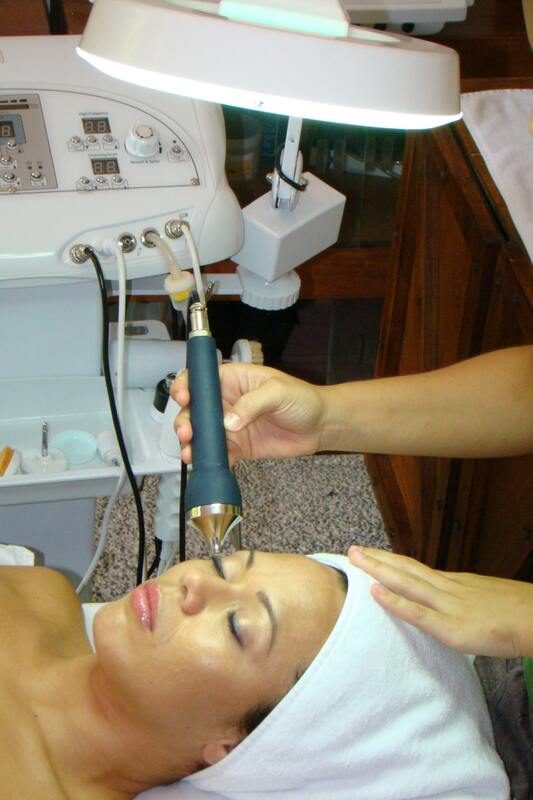 A specialized facial, we use advanced technology in our equipment to promote the activation of a natural collagens to soften deep wrinkles and muscle toning. This powerful treatment provides immediate and lasting active hydration since it is formulated with exceptional 100% moisturizing active ingredients. This excellent anti-aging treatment applies a combination of a pure collagen firming muscle mask, with an immediate acting Tautening serum that gives a lifting effect. Advanced technology provides a lifting effect by application of iontophoresis current to aid in product induction to deeper layers, tightening and firming the flaccid tissue and also provides Oxygenation to the cells. Deep classing and extractions we use product and technology to dry out the accumulated oil below the skin’s surface. To finish the treatment we apply a Detox mask that absorbs impurities, oils, and toxins. Afterward, your skin will feel smoother, clearer, and completely renewed. A treatment specially designed for men’s skin. Helps to restore fatigued skin, clock pores, razor burns, and folliculitis. Revitalizing, detoxifying and firming action against signs of aging soothing and refreshing. Indulge your face in complete relaxation, this aesthetic treatment consists in a deep pore cleansing, exfoliation, steaming, to remove impurities of the skin, followed by a white clay mask, suitable for all skin types and ages. Energizes the skin and improve luminosity delivering a beautiful and healthy glow.